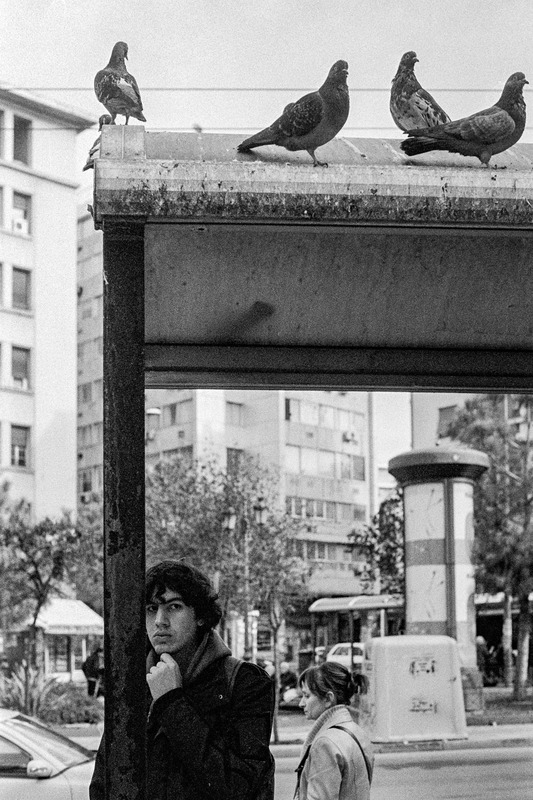 Scene at a bus station whose top is filled with pigeons, while a young man is staring at the camera, wondering at the actions of the photographer. This might be the last photo I will post from the films that I had sitting at home for some years undeveloped. When I finally developed them, I had no recollection of this photo but when I saw it, I remembered why I took it. Pigeons the most common animals in modern cities (excluding rodents and insects of any kind). They can be found everywhere, especially in city squares and parks and they tend to make a mess of every place they decide to make their territory. This bus station bears the marks of their actions since its top was almost completely covered in bird droppings -yet very few people notice it. I was trying the new Agfa APX 400 film and I was looking for any subject to capture, so I was examining every little detail of the places I found myself in. The dirty bus station top with the pigeons on it seemed like something that could help me with the task and I took the camera out to make the capture. As always, I wanted to have a person in the frame and I included this young man in the photo as well. Although I remember the pigeons, I didn’t remember the expression of the youth and I when I finally saw the final result, I was amazed at how he looked straight to the camera. This small detail gave a whole new meaning to the photo as it shifted the subject from the birds to him and I can say for certain that this was the best photo from that film roll!